Yesterday, my layout using the bonus sketch was posted at Sketch Support. You can view the post here. I used the bonus sketch for fireworks, to make flower accents on a 12x12 layout. I layered cut outs from (Crate Paper) patterned paper with Kaiser Craft flowers and Crate Paper buttons tied with Pink Paislee twine. I also stitched "stems" for my flowers with twine and added bows to represent flower petals. 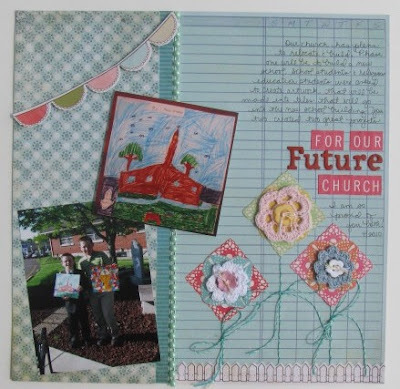 I used one of the May add-on kits from Polka Dot Whimsy for this project. So far, I have really enjoyed my guest designer spot with Sketch Support. So cute...I love how you used the add-on sketch. ok, I really love how you included the drawing. But then adding in those flowers--adorable! And can I just say you are the queen of journaling. Love how you tell your stories!